Many years back, I observed that when two backed up lanes of traffic are merging into one lane, it is always the merged-into lane that moves the slowest, not the lane that is ending up ahead. One might expect the opposite: that the line of cars in the lane that is ending would move more slowly as drivers try to move into the active lane of traffic. But what in fact is happening is that everyone in the ending lane is trying to merge early at different points in the active lane. And that seeming politeness or prescience actually helps slow the whole process down for everyone. Car traffic is a system – a fairly linear system, so not too complicated in how it works. However it has properties beyond what the individual driver in its midst can see, and which are unknown to him/her. For example, in heavy but moving highway traffic, if one driver slows by stepping on the brakes, all the drivers following will also have to touch their brakes at that same location for a period of time – even though the reason for the first driver tapping their brakes has long since passed. One name for this is a “traffic wave” (a simple interactive model online shows how it works). I witnessed that phenomenon from an office building overlooking US Interstate 5 one early evening in late 1978. Once you see traffic movement from well outside the driver’s point of view, driving it is not the same. I never really thought more about merge dynamics until having to deal daily with one particular highway merge – where Virginia State Route 267 eastbound joins US Interstate 66 – on a commute home in late 2010 and early 2011. The heavy traffic would always be backed up more or less as the two lanes from the 267 spur fed into 66, and the rightmost of those lanes ended. Of course the same phenomenon mentioned above reproduced regularly, with the merge-into lane – the left one in this case – moving slowly and people trying to pull their vehicles into it at the first opportunity. Except, that is, for a few cars zipping along down the empty right lane and merging up ahead. Knowing this particular road, I tended to “precrastinate” and be in the left lane well before the merge dynamic began. Then I noticed that if I let someone in early, I might also have to let someone in later on. And there were other dynamics one observed, like the driver ahead letting everyone in in front of him/her. Or in the right lane someone fully stopped well before their lane ended, with their blinker on and a tail of stopped traffic behind them. In the US, waiting your turn in line is part of the culture. Cut in a line of people waiting to get to or through something, and folks disapprove, grumble, and maybe publicly mutter their opinion of your action or character. This social norm is functional in many situations such as ticket windows and cafeteria lines. Highway traffic is different because you can’t do a U-turn to go back to your proper place at the end of the line and wait your turn (imagine the traffic consequences). So drivers tend to want to do the next best thing, which is to merge into the line in the first opportunity. At least that’s better than trying to cut in at the head of the line, right? For their part, the drivers in the merge-into lane accommodate early merges – after all that seems reasonable and they’ve been on the other side too. So what you end up with is the dysfunction I observed already years ago: the merge-into lane moving more slowly, and the merge from lane mostly empty except for cars slowing down to merge a soon as they can. And the occasional vehicle zooming down the merge-from lane and out of sight. That dysfunction is heightened to the degree that early mergers feel offended by the seeming impoliteness of late mergers (for example, see discussions from 2016 & 2017), and compelled to enforce denial (blocking at the merge point or straddling lanes). This was the potential scenario I had to consider on I-75 the other day, having already passed a lot of early mergers already. Apparently efforts to re-educate drivers on this point are having mixed success, at least in the US. 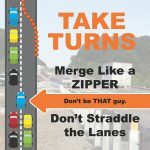 My impression is that zipper merging is gaining some traction in the Washington, DC area, but it clearly was not used on the road to Detroit. (A 2016 Business Insider article highlights the experience in Missouri, Kansas, Washington, and Minnesota). From a cursory look at info on other countries, it’s not clear that people in general take that readily to the concept. Aside from public education, improved signage (either promoting zipper merge or simply not indicating which lane will be closed until later), there are even some efforts to educate children (future drivers). It may take a while to change prevailing attitudes, but it might help to frame the issue in terms of traffic as a system, with dynamics you can best understand by stepping outside of your role as a driver (incidentally the kind of perspective that would inform programming of self-driving vehicles). In the meantime, unfortunately, one can’t expect that trying to use the more efficient zipper merge will necessarily be met with approval. So on that stretch of I-75, I ultimately played it safe and found a gap in which to semi-early merge. Then one other vehicle sped past to the merge point – and I may have been the only one who didn’t mind. This Earth Day I’d like to share some small measures my household has taken and/or does take for the environment. These are not that special (well they were a little bit to us), but such efforts small though they be are not insignificant, especially on the very local level, and if joined by those of others has cumulative value. Of course individual and even collective efforts to be environmentally responsible pale in comparison to the potential positive or negative effects of policy decisions affecting whole waterways, air quality of entire regions, and vast hitherto unspoiled natural areas. But we have our parts to play. For the seven years we were in Falls Church, Virginia, we used a backyard compost pile. Into this went virtually all readily decomposable vegetative matter from the yard – to the extent that I even stripped green leaves off of pruned branches before discarding the latter (this went quickly with garden gloves) – as well as all kitchen scraps (non-animal and non-cooked) from meal preparation. 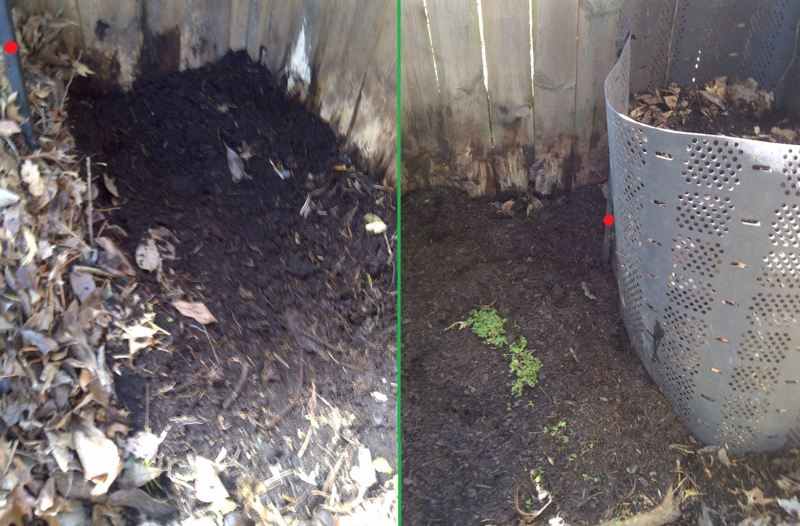 The kitchen scraps were buried in the existing compost to reduce potential smell (which we never found to be a problem). Ashes from the fireplace insert also went into compost. If there was any hint of any animal getting into the compost, I’d add powdered red pepper. System was 2 pile, with 6 month rotation (each batch having 6 months active, and 6 months curing), and use of the old pile in late autumn and in spring. Mainly on the vegetable garden. Compost pile. Left was active, then shifted to right in compost ring. Pole separating halves is marked with a red dot. We had a very modest front and back yard, which were easy to mow with a manual push mower (once as late as December), which also was a kind of exercise. Grass clippings were allowed to fall back into the lawn (not collected). Some hand weeding – moderately extensive on a couple of summers – with the plants of course going into the compost. Never put chemicals on it with the exception of a couple of products (one supposedly eco-friendly) in 2011 or 2012 to reduce the mosquito population. The big autumn leaf-fall went on the curb for pick-up (hand-raked and carried, not blower driven). The payback in Falls Church was leaf mulch offered by the city in the spring. One ash tree brought down by an ice-storm, one magnolia branch that fell on my car in a thunderstorm, and a range of cut branches over the years from a small but exuberant lot, all were cut for use in the fireplace insert. Only the thin branches and thorny ones would go out for pick-up (again, probably the only household that had those stripped of leaves). We ultimately had five 50-60 gallon rain-barrels out during the warm months to collect rain for use on the flowering plants and vegetables. This was useful, but it sometimes seemed the barrels were full to overflowing during rainy stretches, but then empty during the dry spells. It is significant how much water one can use on gardens even in a humid temperate zone. We had two 3′ by 11′ raised beds for vegetable gardening (size convenient from four 14′ planks (I think they were 2″ by 8″). The story of the garden itself would be a whole different write-up, but suffice it to say that it was a mixed success depending on crop, but on balance a lot of production and some very tasty results. The residues were all chopped up into the compost in the fall. As mentioned above, all kitchen scraps went into compost. For a while we included eggshells as well. These were collected in a double plastic bag held in a small container attached to one of the under-sink doors. So basically things to throw out were: 1) trash (see below); 2) recycling (handled by the city); 3) compost; and 4) the few items that went down the disposal (minimal food waste is fundamental for any environmentally-conscious system). Cooking is cooking, but since I’m currently living alone, I’ve added an innovation to steam something on top of whatever I’m boiling to get double use from one burner (e.g., pasta below, and broccoli on the steamer insert on top of that pot). Conservation in meals is another topic for another day, however. I forget where we started this, but it may have been in China. We have used smaller waste receptacles that permit use of plastic shopping bags or the smaller bags you put loose vegetables in to take to the checkout. We really didn’t need bigger bags even in the kitchen given we recycled or composted so much. I can’t recall buying packages of trashbags except for a specialized packing need almost a decade ago. We also bring reusable bags to market, but it always seems that one collects plastic bags from stores. Some of these handle trash no problem; the rest can be recycled. Hardly exceptional, any of this, but useful perhaps in illustrating one family’s system, and more or less coherent approach to the proverbial reduce, reuse, recycle. Taking the opportunity again this year to publicize the latest in a series of annual symposia in New York on language issues in international contexts. The last two dealt with language(s) and the Sustainable Development Goals. This year’s edition, to be held on 10-11 May 2018, has as its title, “Multilingualism in International Organizations and in International Co-operation.” It is sponsored by the Study Group on Language and the United Nations in cooperation with The Centre for Research and Documentation on World Language Problems, the Center for Applied Linguistics, and Birkbeck, University of London. 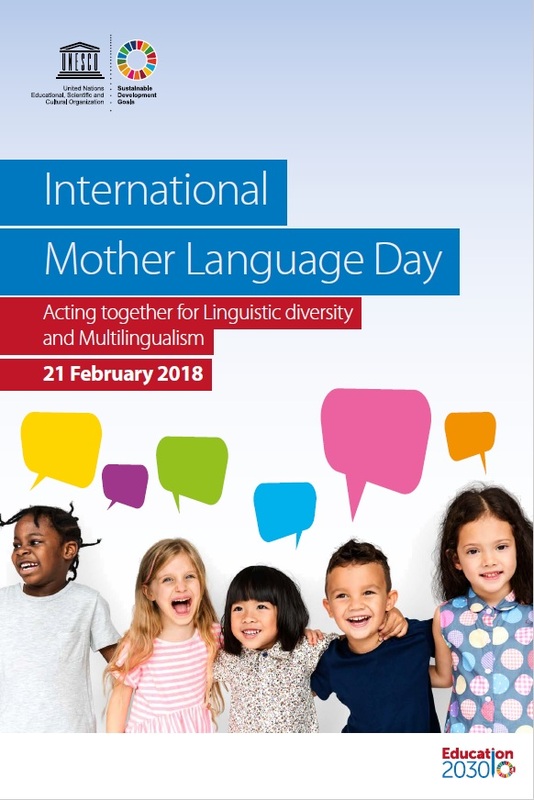 Multilingualism in international co-operation entails both costs and benefits: costs because it requires mechanisms such as the selection of multilingual staff and the mediation of language professionals; benefits because, if properly managed, it includes all parties to decision-making, promotes consensus, supports programme delivery, and aids dissemination of results. Thus it favours social justice and inclusion. Increasingly, multilingualism is seen as a positive force, though it is not always recognized as such by all stakeholders. Within the United Nations, for example, owing in particular to the scarcity of available data, advocates of multilingual language policies often face ideological, financial and administrative resistance, despite a growing recognition that multilingualism, as a core value of the UN, is a potential source of strength. This symposium seeks to focus on, and generate interest in, these issues. Contributorscription will address the challenges of supporting multilingualism in organizations and in sites of international co-operation across different sectors (e.g. business, diplomacy, economics) and communities. Included will be theoretical and methodological studies, on the one hand, and studies addressing specific practical challenges, on the other – especially papers that focus directly on the work of the UN system or other international bodies, or research having obvious implications for their work. Swaziland’s dream of linguistic representation in international organisations: Will the sociolinguistic map of the United Nations ever change? English at the International Criminal Court: Working language or default language? Parallel language use: A Nordic solution for multilingual organisations? A language is far more than a means of communication; it is the very condition of our humanity. Our values, our beliefs and our identity are embedded within it. It is through language that we transmit our experiences, our traditions and our knowledge. The diversity of languages reflects the incontestable wealth of our imaginations and ways of life. The annual Linguapax Prize, which recognizes contributions to “preservation of linguistic diversity, revitalization and reactivation of linguistic communities, and the promotion of multilingualism,” is traditionally announced on IMLD. This year’s prize was awarded to BASAbali, an organization founded in 2011 to support and develop the Balinese language of Indonesia, and to develop language revitalization methods. BASAbali is founded in the belief that all languages, but most importantly a language of a great culture such as Balinese, deserve recognition and use in the modern world — and not be relegated to a language of rural farmers or a language of home, not worthy of activities associated with learning, public affairs and local educational and political practices. The aim, in short, is to develop facilities that will enable Balinese and other local languages to occupy a position of prestige alongside modern national and international languages and to carry forward their rich cultural traditions. This year has been one of some personal transitions, hence less posting on this blog than originally planned. As 2017 comes to a close, I wanted to touch on a couple of topics among several related to the blog content. First, 2017 is the U.N. Year of Sustainable Tourism for Development. Usually I try to get out quick mentions of such observances early in the year, but this time had planned a longer treatment mentioning two places I know in different ways – Djenné, Mali and Lijiang, Yunnan, China. That material will have to come out later in different form. However the topic of this year will remain important even as the calendar changes. Early in the year, I posted several “why are we doing this?” (WAWDT) questions about policies that seemed ill-considered. That is, beyond the level of agreement or disagreement on particulars, but questions about the soundness of decisions from whatever viewpoint. Very quickly it became apparent that any attempt to continue such inquiries would become all-consuming. That in itself is a comment. In any event, I’m not planning any further WAWDTs for now. 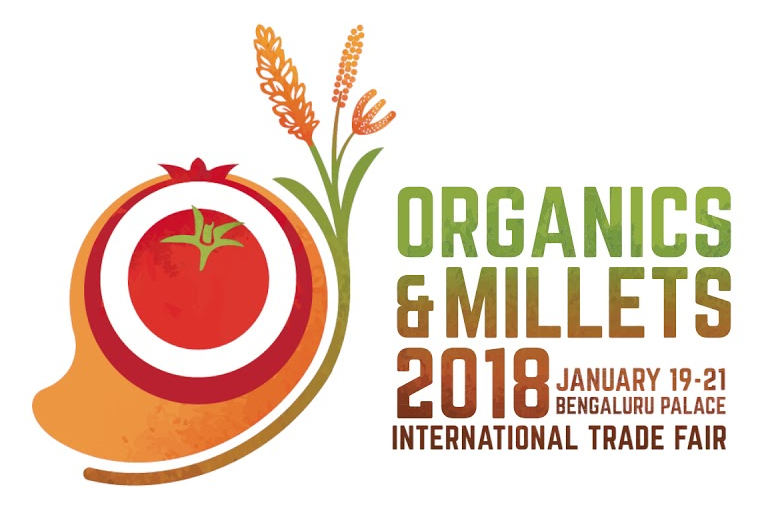 Looking forward to a productive 2018, and sharing ideas and information here on Multidisciplinary Perspectives.